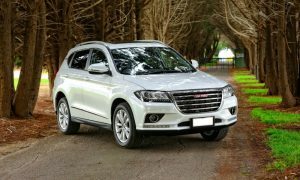 THE GREAT Wall Motors (GWM) premium brand Haval might not be in the range of others, within the SUV market but it stood its time when throttled to. Haval H2 MacPherson front-grille caught my attention. As we took the H2 1.5 T for a spin (with heavy-showers in Jozi) we kinda enjoyed its stability despite a hesitant manual gearbox, that would change its mind at the wrong moment or hold on to the selected gear far away too long. Yes, GWM has invested heavily on the brand and my gut tells a lot will yield positive outcomes in future. At first glance, H2, does not border on the generic or indeed copycat side of things and comes across as a neat, attractive vehicle albeit less attractive than offerings from its competitors namely facelifted Nissan Qashqai and Mazda, amongst others. The interior, expect not much luxury such as navigation and other features associated with latest brands but what ignited my attention was its leg room and the boot. Both came out as tops at glance. Gone is the dot matrix radio display and its rather flashy black plastic surrounds, in place of a touchscreen setup surrounded by a piano key black finish. While this ups the H2’s intended plush feel, what continues to let the side down are cheap feeling plastics, especially the silver inserts in front of the passenger, around the doors and on the door grips. On the open road, it was a case of business as usual with the gearbox continuing to be the biggest culprit. Granted, while going about its business when cruising smoothly, a sudden prod of the throttle would see it dropping up to two gears and sending the revs high, making the engine sound strained. It happened often. Being local for a while, took Haval as claimed 0.4-litres/100km to 8.6-litres/100km between Soweto and Sunninghill at 105kW/202Nm petrol mill. Where the luxury starts to grid its talents is inside. Gone is the dot matrix radio display and its rather gaudy black plastic surrounds, in place of a touchscreen setup surrounded by a piano key black finish. While this ups the H2’s intended plush feel, what continues to let the side down are cheap feeling plastics, especially the silver inserts in front of the passenger, around the doors and on the door grips. Truth be told, I liked the McPherson front-grille design- stru! It comes with a five-year / 100 000km warranty and five year / 60 000km service plan as standard.